UNITED NATIONS, Mar 7 2018 (IPS) - Despite calls for a ceasefire, violent clashes have continued and humanitarian access remains limited in Syria’s Eastern Ghouta, leaving the international community extremely concerned. Since the Syrian government intensified its attacks in recent weeks, more than 700 civilians, many of them children, have been killed in Eastern Ghouta. On Monday alone, over 90 were killed despite the Security Council’s call for a 30-day ceasefire and a Russia-sanctioned five-hour truce in the area. The Syrian government has denied any wrongdoing, including a recent suspected chemical attack in the town of Hammoria. A UN convoy recently delivered the first aid in weeks to the estimated 400,000 civilians trapped in the deadly enclave. However, the mission was cut short and left without unloading all of its supplies after nearly nine hours of shelling. 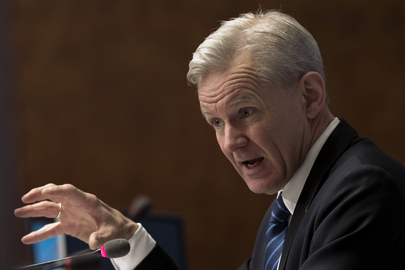 As frustration mounts among human rights officials, IPS spoke to the Special Advisor to the UN Special Envoy for Syria and Secretary-General of the Norwegian Refugee Council Jan Egeland about the humanitarian crisis not only in Eastern Ghouta but across Syria. Q: Would you say the conflict in Syria is the worst crisis the international community is currently facing? The Syrian conflict is the bloodiest witnessed in a generation. It is terribly unique in two ways. Firstly, we have seen unparalleled brutal force used indiscriminately against civilians throughout the seven-year conflict. I know of no other place on earth that is close to having so many children, mothers and fathers fleeing for their lives, murdered or maimed. Over a quarter of a million people fled their homes in January alone, many for the second, third or fourth time. Secondly, Syria’s merciless war is unique because conflict parties have specialised in denying aid organisations access to communities trapped by the fighting. Civilians die needlessly every day because relief workers are prevented from delivering critical medicine, water and food. Q: What are the most pressing needs on the ground in Syria’s Eastern Ghouta? What is your response to the situation there? The besieged Eastern Ghouta is experiencing a real human catastrophe. Four hundred thousand civilians are trapped inside with no safe way out. Twenty-four attacks were reported on civilian targets in five short days in February, including against 14 hospitals, 3 health centres and 2 ambulances. International humanitarian law was created many generations ago to prevent attacks against civilians and medical facilities. Today, Eastern Ghouta and other besieged communities in Syria are utterly devoid of respect for international law. The most urgent humanitarian need now is for a real pause in the fighting that is agreed by all sides. Humanitarian agencies must be allowed to enter to provide sustained services and evacuate the wounded and sick. The convoy that reached Douma on March 5th was a rare achievement. The Russian-agreed five-hour pause is neither long enough nor agreed by all sides, and as a result, civilians continue to shelter from the violence and flee the unfolding ground offensive with little to no access to basic services. Q: Has the UN done enough to help civilians on the ground? UN agencies and aid organisations are ready and willing to do so much more to help civilians in Eastern Ghouta and across Syria, but we have not been granted access by various parties to enter Eastern Ghouta. Our relief trucks are packed with lifesaving medicine, our warehouses are full with food. All we need is a guarantee from the conflict parties that aid workers and the convoys will not be attacked if they enter these besieged areas. Aid agencies and partners inside the enclave themselves have had to suspend operations as they have been targeted in the violence. Before the Douma convoy, only one cross-line aid convoy in Syria successfully delivered relief in the past 8 weeks out of over 25 convoys that we requested access for. This convoy reached 7,200 people in Nashabiya, Eastern Ghouta. We reached zero of the other 2.5 million civilians stuck in hard-to-reach cross-line areas before a convoy to Dar Khabira close to Homs on March 3rd. Q: You told the 23 member states of the Humanitarian Task Force that they have failed to help Syrian civilians. Why did you feel it was necessary to tell them that? My message was blunt but clear. They are responsible for failing to help Syria’s people. Many of these states wield the power to stop this human nightmare today but choose not to. We call on Russia, Iran, the US, Turkey and the Gulf states that all have some influence in Eastern Ghouta to help us with several things: put down the weapons, enable sustained delivery of aid and basic services to all places in Eastern Ghouta each month, and enable the medical evacuation of 1,000 critically ill civilians. All of this is possible if the power players pressure the warring parties. Q: Is Russia’s daily 5-hour pause enough to help civilians? And do you believe that the Security Council’s resolution is strong enough and that their call for a 30-day ceasefire will be implemented? I know of no aid organisation who thinks 5 hours is enough time to deliver relief into Eastern Ghouta, or to organise orderly medical evacuations. We are going to sit down with Russia and other influencing powers, to see if they can help negotiate between all parties that a humanitarian pause will be respected, and for an adequate length of time. The UN Security Council promised a month’s ceasefire which would have enabled us to do our work, had it been respected. While all eyes are on Eastern Ghouta, there are dozens of other places inside Syria, like Idleb province with more than a million displaced, where violence continues and civilians bear the brunt of the conflict. Q: Who is to blame for the lack of humanitarian access? Have the UN/member states been unwilling to push for humanitarian access or is the lack of access largely due to parties to the conflict’s actions to block it? The main reason for lack of access is the Government of Syria denying the so called “facilitation letters” that are needed to get the security forces to allow loading of relief convoys. The UN has been the main force in securing access to hard to reach and besieged areas, but there has been a hardening of positions from the government and some of the armed opposition groups and a less effective pressure from member states on the Syrian government and the other armed actors. Q: What should the international community’s next steps be? Is access to Eastern Ghouta feasible in the near future? We hope to get new convoys soon to follow the Douma breakthrough. Only 27,000 were served and that happened under continuous nearby shelling. Our next step is to sit down again with Russia and the United States and all of those who can influence the armed opposition groups and get an agreement that will help the rest of the civilian population. This is feasible, if those with influence decide to use their power for good. It’s delusional to believe that the U.N. can deliver any sort of humanitarian aid under the present conditions. How long have the “captors” held captive, the civilian population while using them as human shields? Are we to believe, that delivering relief supplies, will end up in the hands of the civilian population, or resupply the captors? Those same captors are not allowing the civilian population who would leave, to do so. And what of the outside countries who are supplying those same “captors”, or should we call them “proxies”, is the U.N. applying the same measure to them also? It seems that the U.N. favors the ones who started this war, for what ever rational is stated today. Call it hypocrisy on the U.N.’s role. What happen in Aleppo and Eastern Ghoutta are similar to what happen to Mosul and Raqqa. Terrorists hold civilians as humans shields. When the counter forces attack the terrorists some civilians, the humans shields, die. Russian and Syrian forces are condemned in Aleppo & Eastern Ghoutta, their actions are called genocide and attempts are made to bring them to ICC. By contrast, Western forces and allies are not condemned for doing the same in Mosul and Raqqa, even though the number of civilian deaths in these operations seem to be greater than the number of civilians deaths in Aleppo and Eastern Ghoutta. Double standard is an understatement.